Experienced cooks know a splash of this or a pinch of that can enhance a recipe. However, experienced bakers know that too many “pinches” can turn a lovely cake into a gloppy mess. Adding an electronic food scale to your kitchen can improve the science of your cooking, take away the guesswork and cut down on the washing up afterward. What is the best digital kitchen scale? Our top pick has to be the Salter Aquatronic Glass Electronic Kitchen Scale with its extra convenient features that set it apart. We love that it can measure not only weights but also the volume of liquids – a unique feature among our reviewed models. In this guide, we will help you discover the best kitchen scale for you through our model comparison chart and kitchen scale reviews. Should You Buy A Food Scale? Kitchen scales provide a much more accurate measure of dry goods. While a measuring cup is fine for liquids, dry powders like flour have been found to be highly variable in their level of fluffiness. One cup of flour may be three ounces, or it could be up to five ounces by weight. This difference in the weight of flour could mean yummy, chewy cookies or hockey pucks, depending on the direction of your error. Although many recipes can survive a bit of variation in measurements, delicate items like a soufflé or a freshly home-baked loaf of bread may be ruined by inaccuracy. 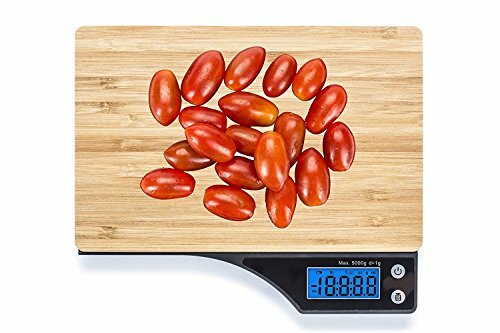 Food scales are handy not just when it comes to perfecting recipes, they are great for coffee enthusiasts who want precise weights for their beans and grinds. Sick of washing 10 different measuring spoons and cups every time you want to bake a single batch of cookies? 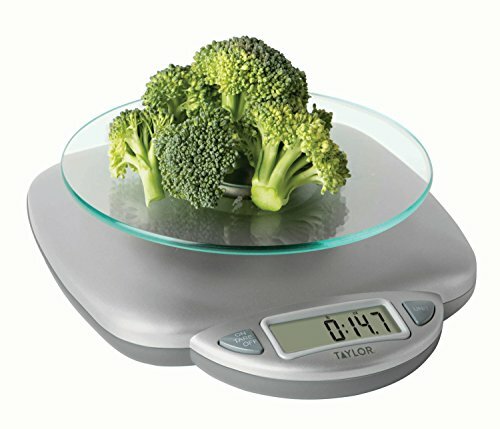 A food scale saves on dishes! You only need to use one bowl to measure every ingredient – that’s reason enough for us to add this simple piece of kitchen equipment to our assortment. 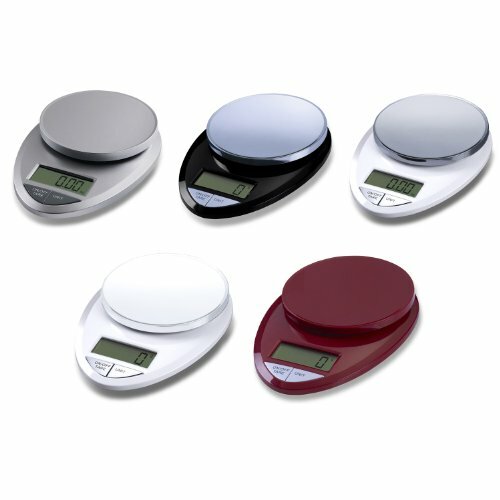 Most digital scales are easy to read and small enough to keep on your counter for whenever you need them. Many take up less space than a paperback book. You can purchase a battery-powered kitchen scale, so you don’t even need to tie up an outlet! With a digital scale, you can place your mixing bowl, zero out the weight of the bowl, and add dry items as needed. Between each addition, you can add up the necessary totals of dry material such as flour, salt, and baking soda and measure the total weight of each product as you add it. The Salter kitchen scale has a limit of 11 pounds and a resolution of 1/8th of an ounce, or about 3 grams. Like all our top picks, there’s an easy tare function available that lets you zero out the weight of a container with a single button. It’s reliable and accurate, but what really sets it apart are the additional measuring features it offers. It can be configured to output the volume of water-like liquids instead of their weight for added convenience. This means you can weigh flour in a bowl, zero the scale, and then use the scale to measure the volume of milk or water you add without any extra dishes. In order to maintain the charge for as long as possible, the scale turns itself off if you don’t change the weight or press a button for a while. Salter has included a long-lasting lithium battery to power this unit. If we had to nitpick, we’d mention that the scale turns itself off automatically a bit too fast. If you find yourself looking up recipes or grabbing ingredients for a while, you’ll have to turn the scale back on and reset the tare. The volume-measuring features are great for Imperial-unit cooks who need accurate measurements of liquids. Users of the metric system have no need for this feature. 1 gram of water has a volume of 1 milliliter. The Salter scale has a futurist glass design with a robust set of features that may make it a great fit your kitchen and definitely worthy of consideration. The Taylor Precision digital scale has an 11-pound weight limit and 1 gram resolution. It’s designed well for kitchen use, with no gaps or cracks, to make cleaning easy. Flour can compress over time, and freezing it can add moisture. Baking powder and baking soda can take on moisture or get packed down in their container during storage. Some herbs will lose weight by continuing to dry in your cupboard. Measuring herbs by teaspoon can be confusing! Do you need to pack the measuring device, leave it rounded, or level it off? Many dried herb fragments are large enough that spoons and cups don’t work well in giving you an accurate representation of what you need for your recipe. The Taylor food scale has a simple tare function and auto-shutoff. Its accuracy enables you to measure coffee or ingredients for baking, which is important if you like to achieve consistent results every time. Taylor includes two AAA batteries to operate the scale. It runs through them a bit faster than some other models, so you may want to consider purchasing some rechargeable AAA’s to replace them. The platform on the top of the scale is also a touch small (just under 6″ wide). You’ll probably be measuring things in bowls or on paper plates anyway, so this isn’t an issue in most kitchens. However, you may want to factor the cost of a mixing bowl or small tray into the cost of buying and operating this scale. The Wasserstein bamboo scale also has an 11-pound weight limit but is accurate to within 2 grams. It has the same volume features as the Salter kitchen scale, letting you measure the volume of water-like liquids directly from the scale. The display has a helpful backlight to make reading it easier, and the tare function is easily accessible. This is a small, compact scale with a stylish bamboo top. It compliments most kitchens without feeling like some futuristic gadget. When you’re not using it, it’s thin enough to slide just about anywhere for storage. It takes two AAA’s, which are included in the package. The buttons on this scale are activated by touch and not pressure, which takes a bit of getting used to at first. You need to sit your finger on them for a little bit in order to trigger them. There’s no pressure necessary. The Etekcity digital scale has an 11-pound weight limit and is accurate to within 1 gram. Unlike our other picks, it’s loaded with additional features – including a timer and alarm, a notification when you’re nearing the scale’s max weight, and ambient temperature readout. The bowl is a major factor when considering this scale and may make it the best baking scale. If you’re willing to use it, it’s great; it detaches for easy cleaning and makes measuring many ingredients convenient. 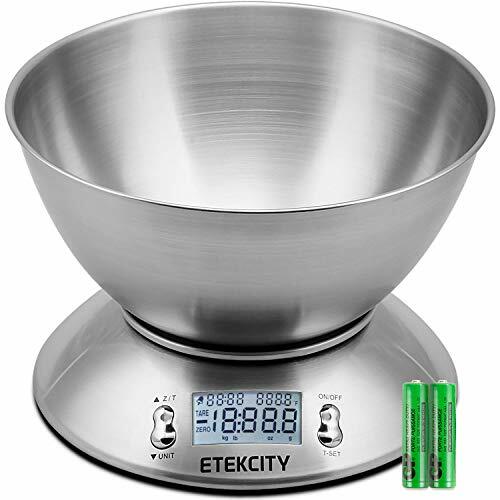 Etekcity has elected to include a mixing bowl for you to weigh things in, which extends an otherwise tiny working area to 2 full liters of volume. Like our other options, you can zero the scale with a single button without turning it off. It’s also out-of-place for some recipes or kitchens. If you intend to use your kitchen scale with your coffee, you certainly don’t need an entire 2-liter bowl on top of your scale. However, with the bowl removed, the weighing platform is quite small. For those who appreciate the space-age aesthetic, the Etekcity kitchen scale is an incredible scale and worth consideration. Like our other choices, the EatSmart digital scale has a max weight of 11 pounds and is accurate to within a gram. It’s amazingly simple to operate, with just two buttons and no fancy functions to memorize. It has a tare function and four units (ounces, pounds, grams, and kilograms) of output. There is a simple test for confirming the accuracy of your kitchen scale. Nickels weigh five grams upon minting. It’s important to keep your food scale in a specific location on your countertop. Small moves are not necessarily harmful, but if your counter is tiled or has other uneven features, bumping your scale around can impact the accuracy of your readings. Set it and forget it until you need it. There are two small downsides to this model. First, the labels on the buttons may rub off after a few weeks of use. We think this is due to oils from your fingers or other ingredients making their way onto the buttons. There are only two buttons, one of which changes the display units, so this is a minor inconvenience at worst. Second, like the Wasserstein scale, this runs through AAA’s a bit faster than we’d like. Again, consider purchasing a set of rechargeable batteries to go along with your scale. Find a food scale that fits with your decor and space limitations. 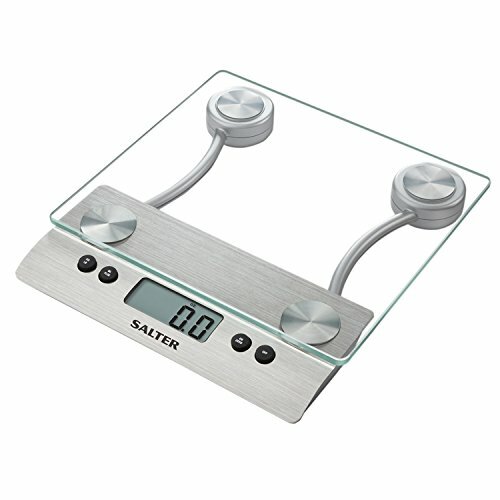 The Salter Aquatronic Glass Electronic Kitchen Scale at number one is a great choice. It’s compact, accurate and stylish, with enough extra features to cover all your kitchen needs, but not so many that life becomes too complicated. Check the accuracy of your scale before you use it with the nickel test described above. If it fails, take it back or contact the manufacturer for warranty replacement. Baking used to be a weekly or daily necessity. Thanks to easy access to quality baked goods, many of us only bake for holidays or other special occasions. If your recipes aren’t turning out as well as you remember, consider adding a digital scale to your arsenal of kitchen tools. You may find big changes in the amounts and ratios of dry goods that might be impacting the quality of your homemade treats.